Oscar, a Google-funded company, started by creating a health insurance "explainer" video. (Bloomberg) — Two health care startups will work with the White House to boost the number of Americans who obtain insurance through the Patient Protection and Affordable Care Act (PPACA) public exchange system. 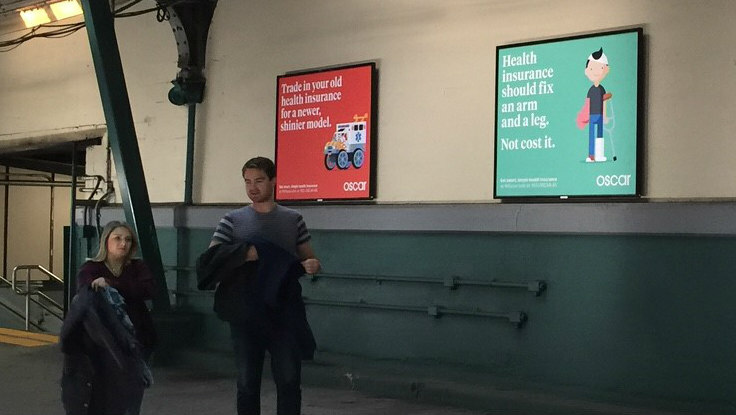 ZocDoc Inc. and Oscar Health Insurance Corp. are providing free Internet advertising that will target the uninsured, the Obama administration says it will announce on Tuesday. The push comes in the final week of the open enrollment period where consumers can purchase health insurance with coverage beginning on Jan. 1. The White House says that about 10.5 million uninsured Americans are eligible for exchange plan subsidies but haven’t purchased coverage. The White House has had help promoting the PPACA exchanges in the past from digital media companies like Funny or Die, which filmed a mock interview with the president and comedian Zach Galifianakis that drove tens of millions of viewers to the U.S. Department of Health and Human Services (HHS) exchange enrollment website, HealthCare.gov. Large insurers and non-profit groups have also promoted the exchanges. During a conference call last month, President Obama said government data showed six in 10 people didn’t know that tax credits were available to help them purchase health insurance. He also warned enrollment efforts would suffer from diminishing media coverage in the third year of the program. ZocDoc, which allows users to book medical appointments online, is planning to target its customers who previously paid cash for medical services or indicated they don’t have insurance with e-mails letting them know that they can enroll in a PPACA exchange plan. The company’s website also will include a banner advertisement on its homepage directing users to healthcare.gov, the federal website where consumers can purchase insurance, according to chief executive officer Oliver Kharraz. “We want to see ourselves as someone who enables access” to medical care, Kharraz said in an interview. That group likely includes millennials, a key demographic for the long-term success of the president’s signature health care law. Younger, healthier customers are important for insurance pools, because they help offset older individuals who are more likely to have high health care costs. But younger consumers sometimes forgo coverage because of other expenses, and because they don’t typically seek expensive medical care. About half the uninsured people thought to be eligible for insurance on the PPACA exchanges are between the ages of 18 and 34, according to HHS estimates. Tech-savvy consumers have been a core focus of Oscar, a Google Capital-backed startup that features a smartphone application that connects doctors to patients and a user-friendly webpage that helps potential customers easily navigate the insurance purchasing process. The company made a splash with advertisements on New York City’s subway system, and is hoping to bring marketing expertise to a new public service announcement it filmed for the White House. The ad is a slick “explainer video of how health insurance actually works,” and explains that subsidies can leave insurance costing less than expected, Chief Executive Officer Mario Schlosser said in an interview. The animated feature uses graphics to explain basics of insurance like co-pays and deductibles. The company plans to distribute the video online in California, New York, and Texas. That’s both where the company currently offers their own insurance plans, and among the areas where the Obama administration has identified as targets for their outreach operations.